The Second Pinna Karate Course-Velvet Beach 3rd, 4th, 5th and 6th of July, 2008. There were representatives from Wales, England, Denmark, Germany, France, Switzerland, Romania and of course Italy present at the course. Wales has been represented by Yoshitaka Karate Club (USKW) Swansea: Patrizio Camillini (Instructor), P. Joyce, H. Cooze, L. Joyce, B. Cooze, L. Morgans, S. Morgans, T. Watkins, R. Lewis, and J. Dobson. 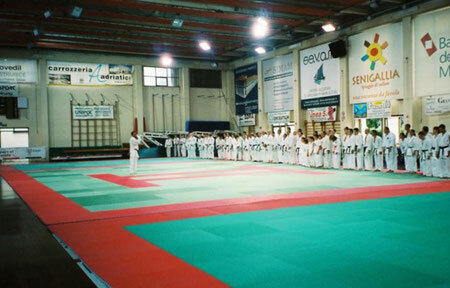 Sensei Camillini and some students travelled to Senigallia, Italy to Train with Sensei Christophe Pinna, the multi WKF World Champion, at a course on the 3rd, 4th, 5th and 6th of July, 2008. The hugely successful course was organised by Senigallia Police Force and the Local Council. 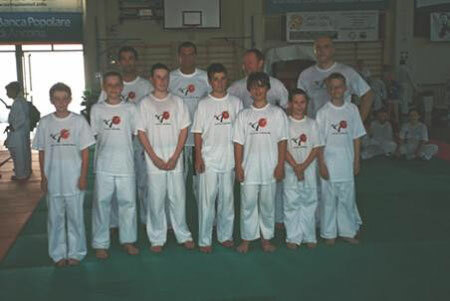 The training was wonderfully lead by multi-WKF Champion Karate-ka Christophe Pinna (France). The course was split into two sessions; during the morning sessions there was athletic preparation on the beach and the athletic track. In the afternoon session we worked on the technique and strategy of modern kumite insider the Sengallia Leisure Centre. Sensei Pinna has developed a programme on the methodology to improve the action and reaction skills in kumite, providing very interesting exercises! All the participants left the course feeling very enthusiastic and promised each other to see them again in Sengallia for next years course! 'The course has been four fantastic days where very good karate was developed and good friendships were forged' - Sensei Camillini. Kumite drills outside in the Italian Sun! Six times WKF European Champion. Twice won the Mediterranean Games. Twice won the World Cup. Four times WKF World Champion. Details from Pinna's Official Website.